Try this delicious pizza twist on the average baked potato! Spray counter lightly with non-stick cooking spray. Combine rolls together and roll into a 10×13-inch oblong shape. Place on a sprayed baking sheet. Poke with a fork several times to prevent bubbles from forming. Pre bake at 350 degrees F 10-15 minutes. Remove from oven to cool. Peel potato and cut into 1/2-inch cubes. Combine sour cream and ranch dressing and spread over cooled crust. Sprinkle with 1/2 cup cheese. 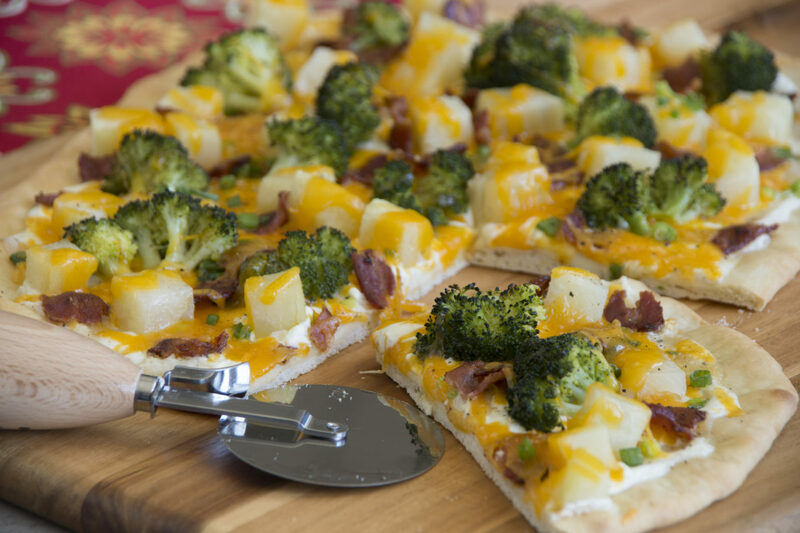 Top with potato, bacon, broccoli, green onion and remaining cheese. Salt & pepper to taste. Bake an additional 10-15 minutes or until cheese is nicely melted.